Engine Comments: Low hours, less than 100 hrs, with enclosed water cooling system. Trailer: Boat is trailable but is docked on water. Boat has Sunbrella enclosure with ArmourHull bottom liner. Comments: Fully equipped fishing electronics. 25 mile Raymariane radar with radar overlay and Auto Pilot. Lowrance Fish Sonar With large Transducer capable for deep waters. Fuel Flow Scan meter with hours. Anchor / Windless System. 52 Gal. Sunbrella top with full Eisonglass enclosure. Lower deck with full Sunbrella/ Eisonglass enclosure. with lots of storage space under cushion, Dinette converts into a large single bed, 3rd bed or storage space under dinette, Enclosed shower / head with sink and vanity, JVC audio system with 12 disc auto changer and I-POD ready, Speakers inside and out (Very Loud), Sleeps 6 comfortably but will accommodate 10. 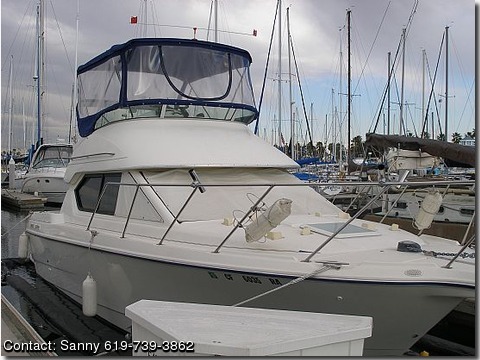 Capable of going to Ensenada or Catalina Island with comfort and Fishability.